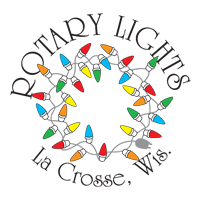 Rotary Lights is an annual gift to the Coulee Region as a cooperative effort among the area's Rotary Clubs, numerous other non-profit groups and volunteer organizations, sponsors, and last but not least - the amazing individuals that make up our Steering Committee and Board. This annual display began in the year of 1995 and has grown tremendously since then due to the fantastic support from the greater La Crosse community. Nearly 160,000 visitors per year enjoy this holiday tradition while driving, walking or taking a carriage ride through Riverside Park. Area food pantries share the items collected during our season. Over 3,000 volunteers from over 100 non-profit organizations supply the "people power" to make our season possible!